Click the button below to add the Linhof Super Technika 4x5 inch Technical Field Camera Brochure - Free Download to your wish list. The most exacting demands in every field are one of the characteristics of our time. To keep in step, it is essential to meet the ever increasing demand for quality. Today, we expect considerably more from a technically perfect photograph than we did only a few years ago. Continuous industrial advances, scientific progress, and rising standards of quality in advertising techniques confront the professional photographer with new tasks every day. The 4x5 LINHOF SUPER TECHNIKA gives him the means to meet not only today’s but also future requirements. To stay competitive and successful, he cannot afford to do without this camera. Its extraordinary quality, unmatched precision, and its ideal design make it an indispensable tool for mastering the latest photographic techniques. A modern fully adjustable large-format camera facilitates the ultimate achievements in photography. The 4x5 LlNHOF SUPER TECHNIKA is the perfect embodiment of this camera type. Its extraordinary precision, large negative format, and the principle of adjustable lens standard and film plane guarantee results to satisfy even the most exacting requirements. 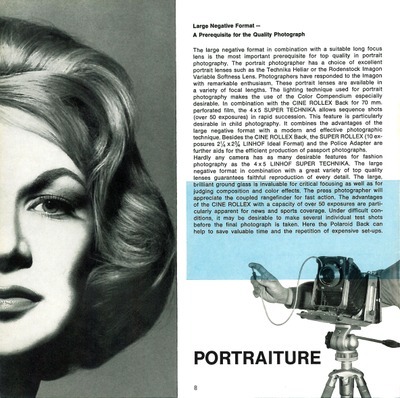 There has been, and will continue to be, an ever growing market for photographs to illustrate pamphlets, catalogs, magazines, books as well as advertisements and posters. Color becomes a more and more dominating factor and the large negative is a prerequisite for highest quality color reproduction. Therefore, publishers as well as editors, advertisers, and many other clients tend more and more to favor only those photographers who work with a large-format camera. Only the large negative offers the advantages of individual processing such as specialized development and corrective retouching. Utilizing all of these advantages is a must for meeting today's exacting requirements. Based on over 75 years of experience in designing and manufacturing precision large format cameras, the 4x5 LINHOF SUPER TECHNIKA was developed as the perfect tool for the creative photographer. In the desire to combine his own photographic ideas with the ideas of his clients, the professional photographer learns to appreciate the adjustability of the 4x5 LINHOF SUPER TECHNlKA. Not only does he, for instance, have the means to avoid undesirable converging vertical lines, but he will also be able to correct or even intentionally modify perspective rendition. Especially in color photography, it is essential to obtain a perspectively correct and, above all, distortion-free negative by utilizing the adjustabilities of lens standard and camera back, because later distortion correction in the printing process is nearly impossible. The unique swing back, a characteristic of every LINHOF TECHNIKA camera, offers the possibility of adding considerable depth of field without further stopping down and sacrificing lens speed. Thus many problems can be solved easily where a less flexible camera just would not do. Time and again, the 4x5 LINHOF SUPER TECHNIKA proves the photographer who works with this camera to be superior. Day after day, for many years, LINHOF TECHNIKA cameras have proved their quality in the hands of thousands of leading photographers all over the world. Today’s models are as much up to date as the first TECHNIKA camera was in its time. Such a camera, matured with experience and in step with the latest technical developments, deserves your unrestricted confidence as much as you will enjoy the unrestricted confidence of your clients who know that you work with a 4X5 LINHOF SUPER TECHNIKA.